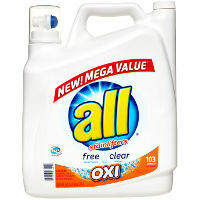 Enjoy a pure, fresh result each time you do laundry with All Free Clear OXI Liquid Detergent. This powerful yet gentle laundry product is great for those with sensitive skin, effectively fighting stains, dirt and odor without the addition of perfumes or dyes. All gets clothes clean and doesn't bother my sensitive skin.